As Cross Rhythms' retrospective on Nashville gospel quartet the McCrary Sisters recently showed, the sibling act's musical pedigree is a rich and varied one. Daughters of the late Fairfield Four mainstay Reverend Samuel McCrary, Ann, Deborah, Regina and Alfreda's musical upbringing was founded in a mixture of the music found in their local Baptist church and the pioneering harmonies that their father's group remain famous for today. 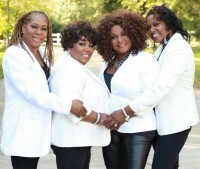 With Deborah and Alfreda choosing to stay at home to pursue careers in nursing and ministry respectively, Ann and Regina soon became individually known as backing vocalists of choice for countless artists with Ann joining the likes of Elvis Presley and Stevie Wonder on stage and adding her powerhouse vocals to albums by gospel greats such as Donnie McClurkin, the Winans and Yolanda Adams. Meanwhile, Regina famously toured with Bob Dylan and appeared on three consecutive albums starting with his Christian-themed 1979 release 'Slow Train Coming' and, more recently, the pair joined Northern Irish troubadour Brian Houston on his hugely underrated 2012 album 'Shelter'. Such demand prompted Deborah and Alfreda to finally join Ann and Regina to record their debut album in 2009 with the acclaimed 'Our Journey' hitting the shelves a year later. Featuring cameos from the likes of country stars Delbert McClinton and Patty Griffin, the album proved to be a success with the follow up 'All The Way' appearing three years later in 2013. The foursome released their third album 'Let's Go' earlier this year. In addition to seeing the siblings in full flight under Miller's production auspices, the album featured an appearance from the Fairfield Four - a move which has led them to share the stage with the longstanding gospel act in a series of concerts under the collective Rock My Soul banner. I catch up with the four sisters during rehearsals for one such Rock My Soul event - as part of Perth's well-established Southern Fried Festival celebration of American roots music - in one of the meeting rooms of the Scottish city's Concert Hall to ask them how it feels to be teaming up with their dad's old group which, through an ever-evolving line up, is approaching its centenary in 2021. "Well, it means a lot to us because we are carrying on our father's legacy," advises Ann. "It's such an honour to see that what he worked so hard to keep together is still going strong and we're delighted to be a part of that." The run of Rock My Soul collaborations is certainly not the first time that a McCrary sister has shared the stage with the Fairfield Four with Ann first stepping up to join her father and his group on stage at the tender age of three. "I was so young," she recalls. "I have a few memories but not as many as I would like. A lot of people tell me that I used get up on stage with them and I have flashes of memories here and there of singing with the Fairfield Four." I suggest that this early exposure to singing live and the fact that Sam McCrary must have frequently brought his work home would have had an effect on the girls' musical upbringing. "Music was all we knew," Ann confirms. "Growing up, we just thought that everybody could sing. We thought that it was just a common thing so when we found out not everybody could sing, we were surprised!" Like many other sibling acts, it's clear that the McCrary Sisters have a head start when it comes to understanding each other musically. "Being related to each other brings closeness in terms of music," Ann agrees. "The harmonies are a natural thing for us as sisters. I don't think we try to mimic anybody else's style. If we were to start a song right now, we would just make it our own and I think that it comes across to an audience that the music we sing is our own. We give it from the heart." This conclusion is certainly backed up by the McCrary Sisters' new album 'Let's Go' which drew on the production skills of singer, songwriter and husband of singer Julie Miller, Buddy Miller and is arguably their most accomplished release to date. "We're really happy with the new album," states Regina. "Buddy Miller's our brother and having him put his touch on our record is marvellous. He has a sincere and good heart. He knew exactly where he wanted to go with our sound but he also left the door open for us to be ourselves and not sound like something he just heard in his head. He came to us with a bunch of songs - about 50 or 60 - and told us to break them down to 20. So we broke them down to 20 and then he said 'break them down to 12' and we did that too. After we broke them down to 12, we told Buddy that we wanted to put some original songs on the record too and he allowed us to do that. He enabled our creativity to mix with his and that's what you get on the finished album." Boasting a myriad of big names on their collective CV in terms of collaborations and backing vocal session and live work, I ask why the McCrary Sisters - in particular Ann and Regina - have in the past established themselves as the go-to people for legends such as Elvis Presley, Bob Dylan and Stevie Wonder and continue to provide their indelible touch to many established acts today. "We love doing our own thing," suggests Ann. "That's the major thing for us. However, we are able to be versatile in different styles of music so we get asked to do background music for a lot of different people and we're able to do that. We can go into a studio and do whatever style of music that they ask us to do and we are capable of doing it. That's why we're called on so many times." Remarkably, given a history of mingling with music royalty, all four sisters come across without any airs and graces about some undeniably momentous and career-defining moments. "For us, you have to be big enough to be small and small enough to be big," advises Regina. "You've got to have that balance and you've got to be ok when you have it and when you don't have it. You have to know that every gift and talent comes from God so it's not our place to boast or brag. God has trusted us with these talents and we need to take care of them and make sure we don't abuse them or get a big head. You have to stay humble because you know, at any moment, this could all stop. However, because of the grace of God and his mercy and this being our season, we know we're right where we're supposed to be and this is only the beginning of where God is about to take us." "It's in our upbringing as well," Alfreda agrees. "We were taught to treat everybody the same and with love. If we treat everybody with love then you can't be star struck. When we meet or work with somebody famous - we just treat them with love." With the Southern Fried Festival in full swing and the outdoor stage drawing a growing number of Perth onlookers outside the window of our makeshift interview room, I ask the McCrary Sisters to sum up how they feel about closing the weekend's festivities as part of a double bill with a group that they will forever be intrinsically linked to. "We are really really excited about performing with the Fairfield Four tomorrow night," enthuses Ann. "It's all part of our legacy and, even though these aren't the original guys and it's a new generation of the Fairfield Four, we get to share with them and the audience what we know about a group that we've grown up with and has been part of all our lives throughout the years. It's very powerful - it really is."